Limited Edition 140 Gram Snow White Colored Vinyl. 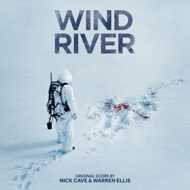 Frequent collaborators Nick Cave and Warren Ellis have teamed once again to score the new film Wind River. Marking Sicario scribe Taylor Sheridan’s directorial debut, the thriller stars Jeremy Renner and Elizabeth Olsen as a game trapper and rookie FBI agent, respectively. Together they investigate a young girl’s murder on Wyoming’s remote Wind River Indian Reservation.